Thanks to the media, few people know that before the Israeli Defense Forces (IDF) destroys a building or home in Gaza, the occupants are warned to leave. Although this is not an entirely new Practice, for example, NATO attempted to warn civilians of during the Kosovo conflict but their methods proved to be ineffective. What is new is the extent to which Israel goes to protect the lives of innocent Palestinians, which is unprecedented in the history of warfare. Before a target is destroyed, the civilians are warned to evacuate the premise through a combination of phone calls, text messages, Robo calls, and leaflets. The early warning system can undermine the purpose of these military operations by giving the terrorists, who are the intended target advance notice to leave. 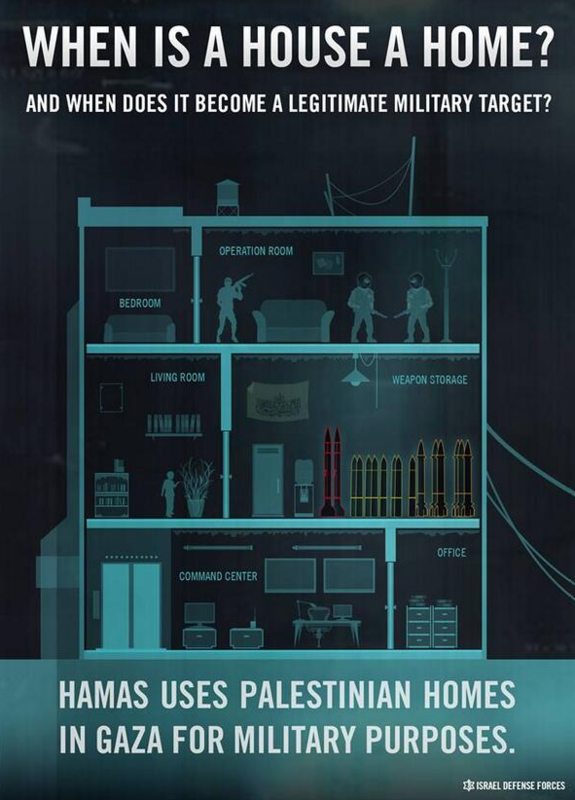 The IDF uses another method to warn civilians known as “Roof Knocking.” This is when they shoot a non-explosive missile at the roof of the intended target, signaling to those inside to get out before the building is destroyed, which usually comes five minutes later. Below is a video that captures several “roof knocks.” As you will see, the clips have been edited to speed up the time from the initial “knock” to the destruction of the building. Below is an example of what a phone call sounds like when the IDF issues a warning. Why would Hamas want innocent civilians to return to their homes, knowing full well they are placing their lives in danger? Frankly, they don’t care. In a sick and twisted way, Hamas benefits by when Palestinians die. Each photo of a dead child or weeping family only provides more material for their propaganda war. The goal of Hamas and other Terror organizations is not the safety of its people, but to wipe Israel off the map. If Hamas valued the lives of the Palestinians, then why did they use all the resources contributed by the international community for the purpose of rebuilding of Gaza, and instead, built underground tunnels into Israel at the cost of 3 million dollars for each tunnel, and so far, close to 40 have been found and it’s expected that many more will be uncovered (See photo to see what $3 Million Dollars could have bought). Not only are these tunnels used to infiltrate Israel, but they serve as bomb shelters for the Hamas leadership and are off limits to civilians. One would think that these kind of facts would be a featured story on the nightly news, emphasizing how immoral Hamas is. The moral contrast between Hamas and Israel couldn’t be any clearer. On the one hand, Hamas “desires death” the way Jews “desire life.” The IDF’s early wanting system is a perfect example of how much Israel is committed to life, not only the lives of Jews, but also the lives of innocent Palestinians. While Hamas, does everything they can to kill Jews, even if that means putting their own civilians lives at risk in the process. What these facts tell me is that Israel values the lives of the Palestinians more than their leaders do, and the irony in all of this is that Israel is routinely accused of committing war crimes by the international community, for doing what no other country has ever done before to limit the loss of innocent life, against an enemy that uses the death of its civilians to further its agenda to kill Jews. “No other country in the world does this” is an important reminder that the US barely acknowledges the civilians we kill. Correct me if I am wrong but I assume you are referring to this presidents use of drone strikes? If that’s the case then you are correct, I don’t think anyone knows the extent of civilian deaths caused by our drone strikes. One thing is for sure, there is no way we call the terrorists were about to kill or send them a warning shot, that’s for sure.